Take out our basic Snow Park Package and enjoy all the main activities and attractions to be found in this spectacular winter wonderland. Unlimited access to rides; Bobsled, Tubing Run, Snow Bumpers, Climbing Wall, Snow Plough Playground and Ice cave. One Zorb Ball (Giant Ball) Ride. Take out a Snow Classic pass to add more fun to your standard Snow Park Package! For safety reasons, children under two years of age are not allowed to enter Ski Dubai. Guests under the age of 14 must be supervised by an adult of 16 years or above. Boost your Snow Classic experience to enjoy even more from Ski Dubai! 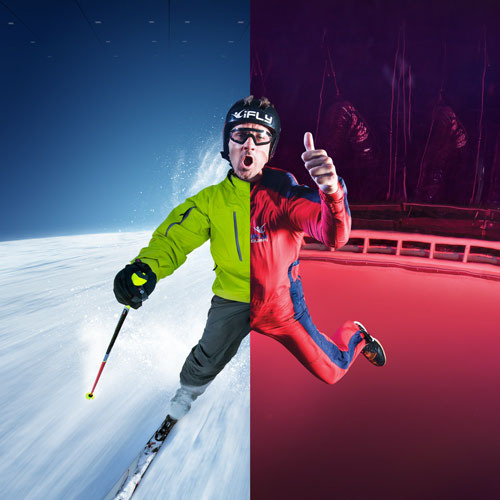 Enjoy both the thrilling experiences of our Ski Dubai Snow Fun activities and flying at iFly Dubai indoor skydiving at City Centre Mirdif! Guests under the age of 14 must be supervised by an adult of 16 years. Strap yourself in and enjoy two rides on our thrilling Snow Bullet zip wire! Kindly note a refundable deposit of AED 25 per guest will be collected for the Access Card person at Ski Dubai Admissions counter. Kindly note Ski Dubai takes refundable deposit of AED 25 per guest the Access Card at Ski Dubai Admissions counter. 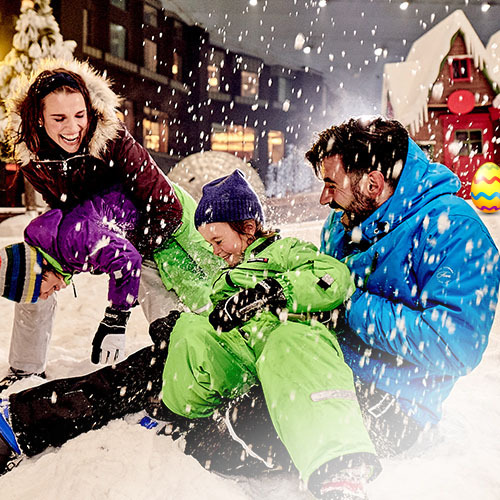 Enjoy a fun-filled day at Ski Dubai, with one of our amazing Snow Fun packages! Choose one of our tailored packages to gain access to our incredible attractions. Hold Tight For Our Amazing Bobsled Runs! Hold tight and enjoy our amazing twin track bobsled experience, as you hurtle through the snow for a winter sports experience like no other. Gain a Better View, With a Chairlift Ride! Take in the beautiful view of our Snow Fun and indoor slopes, with a ride on the state-of-the-art Ski Dubai chairlift. 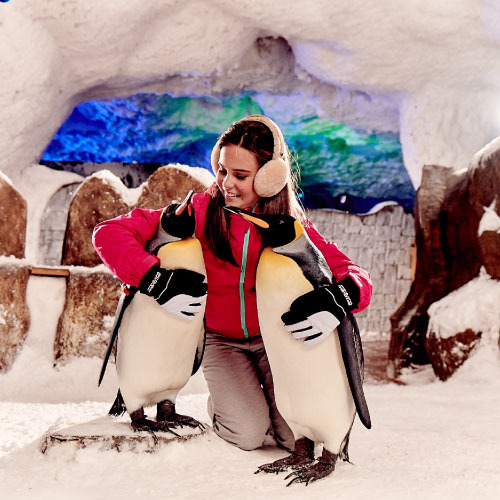 Be Mesmerised by the March of the Penguins! Don’t forget to see the phenomenal March of the Penguins at 2, 4, 6 or 8pm, and watch our beautiful colony of King and Gentoo Penguins put on a performance which is sure to delight. 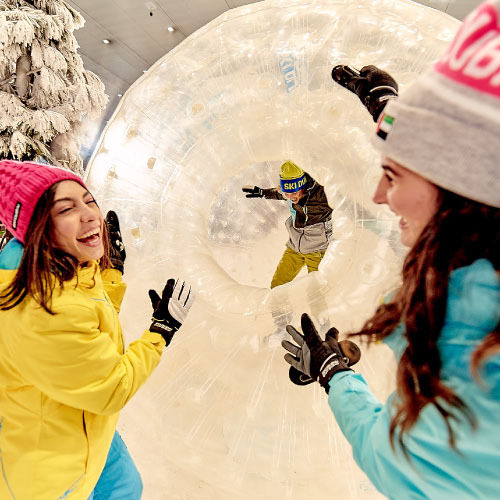 If you want some serious fun, then join us for an exhilarating ride that takes you downhill at a fast and controlled pace in the giant Zorb ball, one of Ski Dubai’s most popular attractions. Do you feel the need for speed? Then strap yourself in for a ride on the Mountain Thriller, a custom-built ride which rockets down a 185m high slope at speeds of up to 45kph – this is not one for the faint-hearted! Enjoy some good, old-fashioned winter fun, by tubing at Ski Dubai! Wrap up warm and take in the incredible view as you ride through the snowy landscape on your tube. Think you’re brave enough to tackle the Snow Bullet? 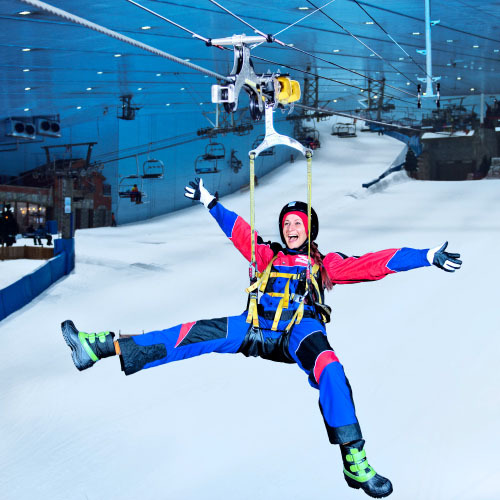 Fly through the skies 16m above the slopes and the Snow Fun, on this custom-made, 150m long indoor zip line, a first for the UAE! Wrap up warm and strap yourselves in for some snow bumper car mayhem! Challenge friends and family to a bumper car battle and bounce off one another in a beautiful snow-filled arena. This timber structure is a replica of a Piston Bully and a new edition to the Snow Fun. Kids will love climbing on and experiencing the fun of crawl tubes, slides, slackline, climbing wall and an interactive driver’s cab. The cab contains a seat, steering experience and life-like noises and will keep the kids amused for hours. The rocky mountain themed Climbing Wall is for all kids and is an easy and quick climb to the top. The Sliding Hills are bound to leave the kids laughing while they enjoy sliding down the snowy smaller slopes.